While several of the region’s top teams were in Florida for Warm-Up this past weekend, Easterns Qualifier probably gave the best sneak peak into the middle tier of Atlantic Coast Regionals we’ll have before the Series. The tournament finalists, NC State and Maryland, built upon their solid performances earlier this month at Queen City Tune Up, with both teams showing off depth and implementing systems that will serve them well down the stretch of the season as they hunt for bids. They were by no means perfect, but both teams left Sunday with a path to improvement and a sense of anticipation for the weeks ahead. #25 NC State’s third tournament of 2018 was a bit of a roller coaster. While State ultimately took care of business this weekend with a second straight Easterns Qualifier victory, they also showed off the same vulnerabilities that have plagued this squad for the past couple of seasons. 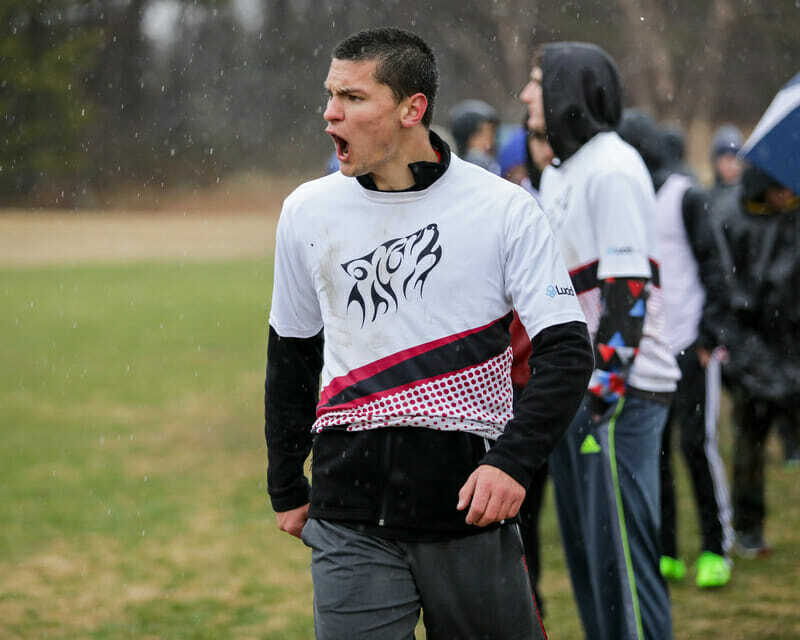 A 15-8 rout of Maryland in the final showed the Wolfpack playing some of its best ultimate; other Sunday bracket games showed State at its worst, unwilling to work the disc up against zones and opting to throw into double coverage. It was a strange contrast fueled in part by the familiarity that has been bred between State and its Atlantic Coast rivals. Chippiness and physical play abounded in their game against South Carolina and State was nearly brought down by the Gamecocks on double game point after being up 9-3. Despite the vulnerabilities, State’s players showed a great deal of resilience; by the time they reached the final, they were missing six players to injuries—including center handler David Jones, who injured his wrist against South Carolina. Sophomore Rhys Gretsch and junior Bailey Laberteaux guided State’s offense from the backfield, with Gretsch putting on a spectacular showcase of skill for State’s D-line offense, throwing a combined seven assists or hockey assists against Maryland. Shifting other offensive pieces over to the D line helped State settle in and attack their opponents with a variety of set plays off of a turn. Maryland gave way quickly to State’s powerful D-line offense and was never truly in the game after the first half. Maryland had another promising weekend, advancing to the final and playing what was the game of the tournament against Georgia Tech in quarterfinals. Coach Darryl Stanley was very pleased with his team’s depth and exuded confidence in Maryland’s reliance on the entirety of their roster. Maryland was able to handle the windy conditions in Myrtle Beach capably enough with a steady backfield that made short work of zones thrown at them. Consistency and the quest for more dominant performances out of players like fifth year Alex Liu will be the key to Maryland’s success down the stretch. While it’s nice having a dependable roster, the lack of elite star power could pose a challenge for the squad at Easterns where they will definitely face the very thing they take pride in lacking. Of the other quarterfinalists, Georgia Tech Tribe showed the most promise this weekend. Georgia Tech’s 16-14 loss to Maryland was undoubtedly the best game of the tournament, but certainly not Tribe’s only good performance. On Saturday, they beat NC State 11-10, showing off greater consistency on offense in a windy first round. Aside from those two games, Tech dominated all comers, ending the weekend with a +31 point differential. “Once their offense got going, they were hard to stop,” said NC State coach Garrett Dyer. Tribe found great success in its vertical sets with Ashwin Anantharaman and Micah Jo marshaling the offense against person-to-person looks, as well as in zones. Their offensive chemistry was a hallmark of their performance throughout the weekend. Georgia Tech’s defense was also one of the most exciting units to watch during the weekend, with physical person-to-person defense; freshman Tyler French put on a showcase of athletic bids and excellent pulls. Yet despite their success in generating turns, Tech’s D-line offense wasn’t consistent enough to capitalize on Maryland turnovers during the quarterfinals and missed several key opportunities to take the lead. “We need to continue to tap into trust. Our more experienced players can get sucked into trying to do too much and it suffocates valuable opportunities being create by other teammates on the field,” said coach Cate Woodhurst after the weekend. For a team that failed to impress back during the fall preseason at CCC, Tribe looked much more polished and capable of challenging teams in big games. The trust Tribe is trying to embrace will take more tournaments to build but they are a legitimate regional threat that, coming out of this weekend, looks set to play its best ultimate yet. The past two seasons, the Atlantic Coast region has been blessed with D-III bids earned in part by teams attending and succeeding at Queen City Tune Up and other D-I tournaments. Richmond, Davidson, and UNC Asheville employed this strategy successfully in 2016 and 2017, but from all appearances so far, that strategy is backfiring in 2018. Davidson and Richmond faltered in Saturday’s pool play at Easterns Qualifier and didn’t really find their form at any point during the weekend. #18 Davidson still possesses a solid offensive system with one of the best spaced horizontal offenses in the the division, but their trademark high energy was noticeably muted. Meanwhile, #10 Richmond had several players out due to injury. It felt like a very incomplete weekend from both teams. That’s concerning for the Atlantic Coast. With very little margin for error during the remainder of the season, the unthinkable increasingly seems possible—that the Atlantic Coast will become a one-bid region. #3 Dartmouth Pain Train proved to be the only redemption for D-III squads competing in Myrtle beach. Despite some early struggles against Kennesaw State in the wind, Dartmouth’s handlers were able to shoulder the load of playing in the wind on Saturday and showed moments of greatness on very clean pull plays throughout the weekend. Mental consistency and the presence of head coach Colby Clarkson kept Dartmouth steady through a weekend that tested Pain Train’s systems. The young UNC Charlotte star was an impressive talent this weekend and with sophomore handler Jordan Perry out for the weekend with a hamstring tweak, Fairfax was often working both sides of the disc. While it’s hard to imagine Fairfax carrying Charlotte to anything beyond a bracket game or two at Regionals, he sure knows how to create problems for opponents. The young freshman was absolutely electric on Georgia Tech’s D line, launching himself into athletic bids and moving the disc well after the turn. Tribe has a bright future ahead with French on board. Traditionally a more emotional player, Gretsch settled into his D-line handler role for NC State with a great deal of poise and focus. The sophomore stood out for State on Sunday as a dependable superstar not only with his throws but very athletic bids. One of the linchpins of Maryland’s offense, Liu is coming off of four years playing at Penn State and was a very important piece of Maryland’s offense this weekend. His patience with the disc and awareness kept Maryland on top against a resurgent Georgia Tech team that pushed Maryland to the limit in quarters. Comments on "Easterns Qualifier 2018: Tournament Recap (Men’s)"